This is by far the most popular form of spearfishing. Relax, breathe up and descend to the sea floor. Now the type of terrain will determine the type of spot you are looking for. Assuming you are hunting kelp covered reef which is most common, about half way down you want to start looking out for your stalking point. You want to take up position at a spot where you can tuck yourself deep into the kelp yet you have a good vantage point over a wide area. While choosing your spot be mindful of your silhouette. Fishing into the sun will make your targets stand out more while also giving you a few extra stealth points. You also don’t want to be the highest point in the immediate environment. If the terrain is multi-layered you often don’t want to be right at the top or right at the bottom, somewhere between half way and the top is normally very good. Too high and you can be spotted to easily, too deep and it’s tricky to look up and see what’s coming. If you’re at a reef that can’t hold kelp then you’re probably in some current so you need to find shelter from that current. Find a small drop off to tuck yourself behind or a boulder to hide behind. These rest bites from the current are what your targets are also looking for so look out for company after about 10 seconds onwards. If you land in an area that isn’t as good as it looked from above then move on. Maybe give it 20 seconds first then reposition yourself. Once you’re bottom side you’re far better informed to choose the best spot in the immediate area. From there it’s a waiting game. It’s after about 10 seconds you can expect some activity, especially if there are Pollock around, they are normally the first to check you out. Remember to stay smooth in everything you do, you don’t want to spook anything. I tend to stay as still as possible until I’ve taken everything in and got a good handle on my surroundings. If I want to look around I move my head as little as possible but use my eyes excessively. If I’m tracking a target all the movements are smooth but decisive. Sometimes a fish will head straight for you. In this situation you want to get your shot locked in and wait till it chooses which side it’s going to flank to. It will switch left or right at the last moment and that’s when you take you shot. You can risk a head on kebab shot but your target size is massively reduced. You’re far better waiting until it switches sides, as soon as he shows you his flank, show him the steel. Sometimes towards the end of an unsuccessful dive it’s worth going for a hunt. You may have spotted a potential hole or interesting feature in the immediate terrain you can glide around. This can be very successful as any unaware fish can be taken off guard, plus it’s very rewarding to tag something in this way. Overall get a feel for the area and see if it’s fishy or dead. Trust your hunting instinct which has been programmed into your DNA through hundreds of thousands of years of your family line surviving. Trust your gut, it’s been hunting for much longer than you. If the area just doesn’t feel fishy then take 5 minutes and swim somewhere new. Rinse and repeat. While you don’t want to be spearfishing over a pure sand bottom like you find at a typical holiday beach, some reefs don’t hold kelp. Here you want to combine your ambush technique with hole hunting. Which is the best spearfishing wetsuit for you? 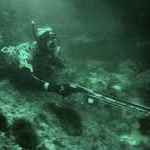 Spearfishing UK – What’s new? Hi Valentine. Amazing story - I envy your trip to Ascension - still have that spot on my top-3 list.